Living up to its name, the Galapagos Giant Tortoise is the biggest tortoise in the world. They're also one of the laziest, sleeping for nearly 16 hours a day! 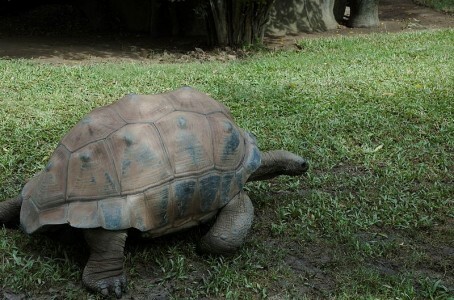 Giant Tortoises used to inhabit every continent except Antarctica. Giant Galapagos Tortoises are not all the same, with almost every island of the Galapagos having its own subspecies. The temperature that the eggs are incubated in determines whether they will gestate into males or females. A higher temperature means that more males will be born. They can sleep for nearly 16 hours a day. Their slow metabolism and ability to take on large volumes of water helps them survive for up to a year without eating or drinking. Spanish sailors who discovered the archipelago named it after the abundant tortoises – Galápago means tortoise in Spanish.